Home → Trending Now → Sheep Make Good Neigh-baas! 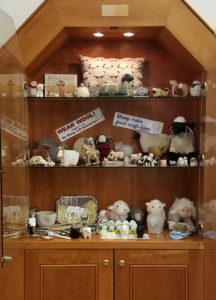 Our April display case features a whimsical tribute to sheep in all their woolly wonderfulness! This lovely display is courtesy of library volunteer Wendy Welter. Stop by and share a smile with us (and pick up a book and movie while you’re here! ).